Terminal Poker is a web based mobile poker room that offers speed poker on practically every type of tablet or phone. They also have a very busy tournament schedule and offer their players 35% rakeback every week, which is a rarity in the world of mobile poker. Terminal Poker is no longer operating. Visit our iPhone Poker page for a full list of real money poker app. Alternatively you can try any of these bitcoin poker sites. iOS, Android, Blackberry & Windows Phone compatible. Lightening fast Texas Hold'em & Omaha speed poker. New sign-ups get a 200% bonus up to €400. Play at Terminal Poker & get 35% rakeback every week. 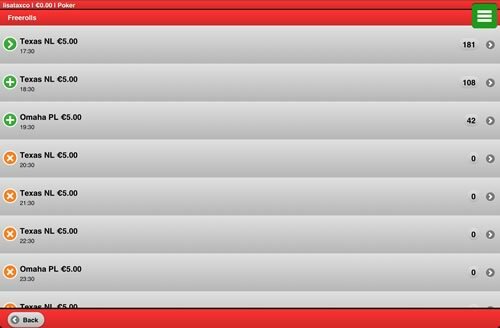 Hourly freerolls & over 30 guaranteed tournaments daily. Plenty of iPhone poker apps available on the web require you to download a separate piece of software in order to enjoy a rather limited selection of tables. Terminal Poker is different in this regard, as the core philosophy standing behind their iPhone poker package was to provide you with a highly portable, browser-based app with enough variants of the game to keep even the most demanding fans interested. Thankfully, the site has largely succeeded in terms of providing you with a quality product, even though replicating some of the inherent flaws of other browser-based apps simply couldn’t be avoided. The end result is rather impressive, making Terminal Pokers one of the most advanced iPhone poker sites currently available on the web. Obviously, browser-based mobile poker software is somewhat notorious for not being very comfortable to use, particularly when the alternative would be to use a dedicated, downloadable iPhone app. Fortunately, Terminal Poker avoids this problem to some extent – yes, the games aren’t as smooth with desktop-based clients, but you won’t be forced to deal with any ridiculous loading games or unresponsive buttons either. Aside from playing poker, the app’s lobby presents you with the chance to try casino and sports-betting products, read the terms & conditions section and whatnot, but what’s really important here aside from the button allowing you to jump straight to your favorite table is the ability to access the banking options, which is something quite a few iPhone poker apps lack. Being able to make a deposit or request a withdrawal is definitely a good thing – and it’s entirely up to you whether you want to do that using your phone, or a desktop computer. 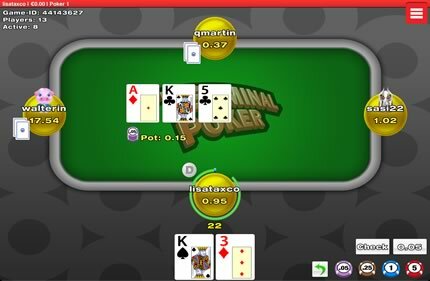 Nevertheless, since you’re reading this review you must be interested in iPhone poker – so I’m glad to report that Terminal Poker gives you access to various kinds of poker tournaments aside from the common cash games. This already places it well beyond the reach of ring game-oriented apps, but what really makes this particular app so cool is the fact that you can play Pot Limit Omaha aside from No Limit Hold’em. Simply put, no site offers you as much as Terminal Poker in terms of game selection. Regrettably, the site’s game selection has a rather serious – and perhaps in some cases deal breaking – flaw, as there are no play money tables available for any poker variant. Fortunately, beginners can take part in freerolls, which are quite common – but in the end this means being forced to wait until those tournaments begin, which negates the advantages of being able to play on the go whenever you please to a large extent. If you’re an intermediate or an advanced player and you’re going to make a deposit you probably won’t even notice, but for a novice this state of the matters is simply rather bad. Fortunately, Terminal Poker rectifies its faults by offering one of the most intuitive browser-based user interfaces available on the web, at least when it comes to customization. 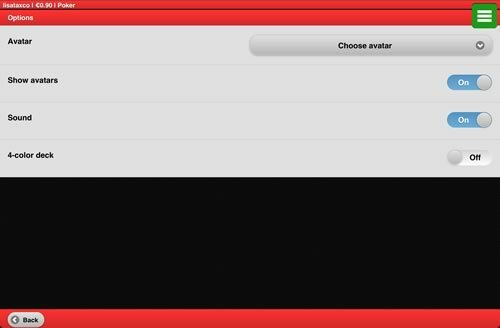 On this site, you can pick your avatar and toggle whether you want to have avatars visible or not, toggle silent mode on and off and pick between a traditional deck or a four-colored one – so you end up having access to all the tools that are often believed to be exclusive to downloadable mobile poker apps. 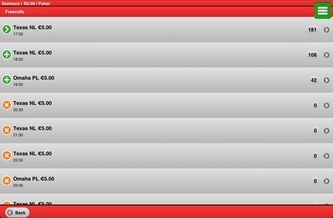 The table mode is equally well designed and adheres to the same, high standards – the buttons are placed just where you’d expect them to be and are large enough to be easy to click, while the graphics are functional despite having a distinct, so-simple-it-must-be-browser-based feel to them. Despite this lack of eye candy, in the end Terminal Poker can easily rival standalone apps in terms of functionality and access to game-related data, which is the most important thing when there’s real money on the line. 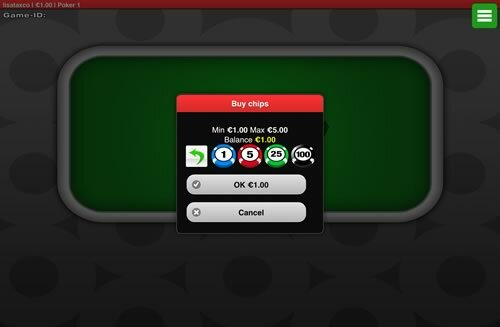 All in all, if you approach poker with a serious, winning attitude you’re going to love this app. More importantly, Terminal Poker offers rather soft competition as the player pool is limited in size. As you’d expect from a rather small poker room, some of the less popular tables might prove to be short-handed outside the rush hours, but in return you get plenty of fish willing to bet out of position and check your monster hands. Consequently, playing on Terminal Poker may easily become a lucrative endeavor even if you aren’t an experienced player – and if you run into a poker veteran, you can easily change the table, as you’re free to choose where you play on this site. Just as you’d expect from a browser-based poker app, no separate download is required, or even available. Nevertheless, playing on Terminal Poker requires you to register an account if you didn’t play on the site using your desktop computer. What makes this approach somewhat cooler than other options is the fact that all mobile players will be using the same set of features, so you won’t ever feel like you’re at a disadvantage when squaring off against Android or Blackberry based users. Simply put, the games are as fair as they get. Signing up for an account is easy and won’t take you more than a few minutes, but you will have to wait for a validation e-mail, which might actually take some time. As a result, last-minute registration wouldn’t be the best idea – if you’re planning a prolonged mobile gaming session, make sure to settle the formalities before you head out. The wait is really worth it though, as Terminal Poker offers a generous welcome bonus of 200% up to €400 on your first payment, so you can rest assured that you’re getting the most bang for your buck here. Picking the right iPhone poker site is always a matter of getting your priorities straight, as each offer available on the web comes with its distinct set of advantages and drawbacks. 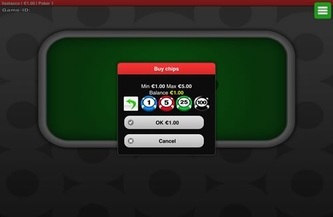 Terminal Poker is no different in this regard, as its mobile package definitely has its flaws – but if you’re willing to sacrifice some irrelevant eye candy and an access to a vast player base of a major poker network in return for a massive selection of poker variants, fair games that don’t give any mobile device user an edge and soft competition, this site is definitely going to suit your needs. Reviews of other iPhone and iPad real money apps.